We tend to underestimate the power words have, especially 1300 numbers. It is simply amazing how words get to set a tone. Remarkably, certain words can either make or break someone’s day for them. It can either inspire you to buy, or steer you in the opposite direction, where you do not feel the need to buy anything. Words can even move you to perform your best when working, or to kick against it. In other words, using the right phone words can either motivate someone into using your service or buy your product, or it will put them off from even thinking about it. There is a certain kind of magic or hidden power in phone words, unlike it counterpart ‘standard phone numbers’. They will either inspire and empower you into action, or disempower you. For this reason business people who decide to make use of 1300 numbers need to choose their phone words carefully. One just have to think about how powerful a tool words that are used correctly can be. Is it for nothing that the bible refers to it as a two edged sword. You could either create the most wonderful and beautiful thoughts through the words you use, or destroy all kind thoughts around you in what you say. It if often best to put a watch on your mouth and first think what kind of impact your spoken words will have on those around you. The same holds true for business owners who want their 1300 numbers to have a powerful effect on their prospects. They should look at ways of satisfying the needs and wants of consumers through using the right phone word. 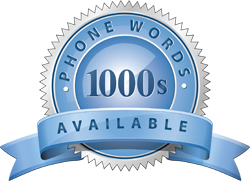 Now that the magic or hidden power of words are out in the open, what power phone words would be appropriate to use for your business? Besides, you want to gain the interest of future customers and make it easy for them to get hold of you. The best way to do this would be to name the service or product you are providing and featuring it as part of your 1300 phone word. There should be no doubt in the mind of your prospects as to what you are all about. The main aim should be capture their interest and spur them into action in wanting to learn more with the selected 1300 numbers. It is not a good idea to use phone words that sound good or intellectual, the words chosen should have a definite purpose and serve to entice, persuade and motivate others into doing business with you. Companies like 1300 Easy Dial has the tools and means to make this a reality.